I’ve described a little of its history here. 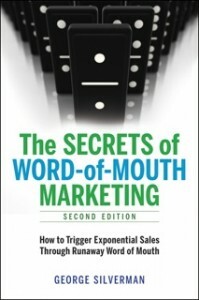 It is a broad, systematic approach to word-of-mouth marketing. It approaches WOMM in principle and avoids getting bogged down in all the details of the tools of word-of-mouth marketing. if you don’t understand the basic principles, you’ll get overwhelmed, fast. That’s what’s happening in life in general and in marketing in particular. I list dozens of broad categories of new media that have become popular since 2001, the publication date of the first edition. ALL of them contribute to the importance of word of mouth and, therefore, to our overload — to yours as a marketer and to your customers. Not only are you and your customers in overload, we are in the middle of several simultaneous revolutions. So, I give you some advice for what to do when inside revolutions. This book will help you know how to think about the wildly changing world we are living in. The first person who I just gave a preview copy to just emailed, “This isn’t a book about word-of-mouth marketing, it’s a book about life.” I couldn’t have hoped for a higher compliment. Click on this link to fill out the download form. I still can’t believe you’re giving this away. I had the good fortune to meet the author of this book, George Silverman, about two weeks ago. My wife and I had just finished leading a personal growth workshop at a retreat center in Mexico. George was participating in another workshop that was taking place after ours. We had a meaningful conversation with George, who was generous with his time and knowledge. As a result I bought his book because my wife and I are trying to find more effective ways to market our workshops. After spending one hour reading his book I was going to write a very positive review because I was immediately impressed with the book. But then I realized, this is more than a book; it’s a workbook. It’s an actual process that deserves more than a quick read. I have now spent two weeks ‘working’ with the ideas in his book. My wife and I have agreed we will spend the next couple of months implementing as many of his ideas as are applicable to our business. I feel as though an experienced mentor is now accompanying us on our marketing journey. But here’s the thing—this is way more than a marketing book. It’s actually a book about how to think, communicate, and live a healthy life. As George reveals in his book, he’s a marketing expert, a psychologist, and a magician. And all three of these ‘parts’ of George collaborated on the writing of this book. It is far more than just a book about marketing. We learn from George how to start thinking about our businesses and our lives in clear concepts, principles, and fundamentals. He is teaching us how to see and think about structure—and this is a source of enormous leverage in our lives. Yes, it applies to marketing, but it also applies to every area of our lives. George is advocating a whole new way of thinking.